It’s your story and you’re sticking to it (maybe)! 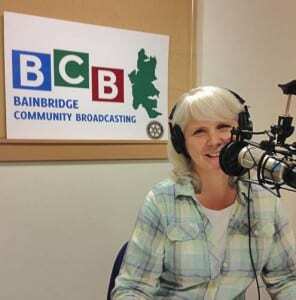 In this podcast, Field’s End Story Slam creator/organizer Wendy Wallace tells BCB host Channie Peters about the plans for this year’s slam. 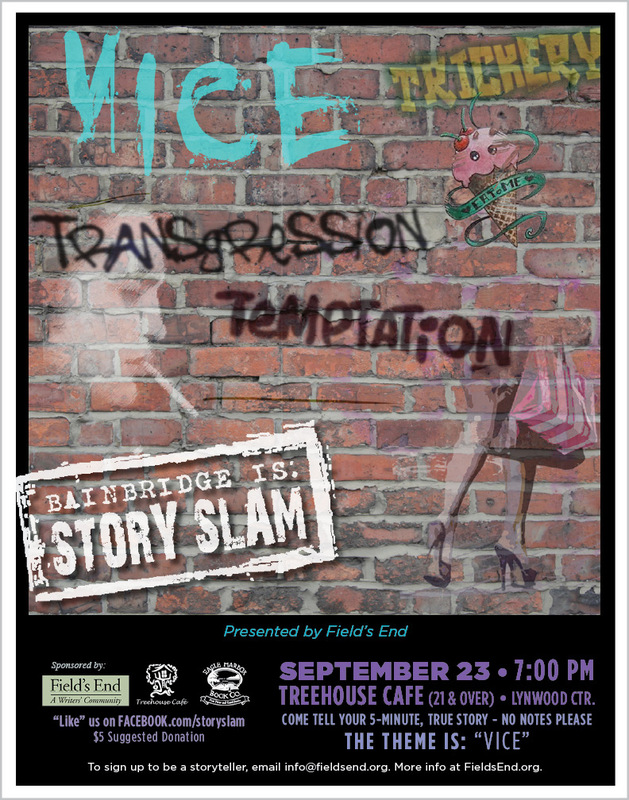 The fourth edition of this popular Bainbridge Island event will take place this coming Tuesday, September 23rd, 7 pm at the Treehouse Cafe in Lynwood Center. 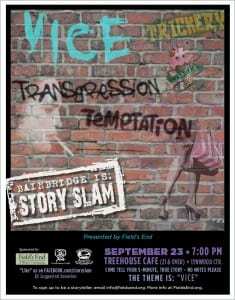 Ten island storytellers will be telling 5-minute personal stories based on the theme of Vice. Panels of volunteer judges from the audience will then rate the storytellers on story structure, performance and format (e.g., that pesky 5-minute limit). The storytellers draw numbers to determine their speaking order, and the judges don’t know the stories in advance, so there is a lot of unpredictability — which is, of course, part of the fun — and prizes will be given to the three winners with the highest points. If you have a story to tell, sign up by sending an email to info@fieldsend.org. And even if you don’t, come join the audience at Treehouse Cafe for what promises to be a very entertaining community event. No reservations are needed, and there is no charge, but a $5 donation (benefit to Field’s End) is recommended. Attendees must be over 21, as the storytelling happens in the Treehouse Bar. And warning: get there early, as the seats go fast! Credits: BCB host and studio tech: Channie Peters; BCB audio editor: Barry Peters; composer of “What’s Up” music splash: Tim Bird; BCB ferry music: Dogfish Bay Studios; Podcast art: artopia creative.